Speedgoat is the monicker of Karl Meltzer in the Ultra Running Community. He is an elite mountain trail ultrarunner and has the distinction of winning the most number of 100-Mile Ultra Running Events, a record of 36 Championship Awards and had been awarded the Ultrarunner of the Year. He is the Race Organizer and Director of the famous Speedgoat 50K Ultra Trail Run and other Vertical Trail Races in Snowbird, Utah. He also one of the most sought after Ultra Running Coaches. He is the first elite ultra runner in the USA who used and introduced the shoe brand HOKA ONE ONE and the rest is history. It is fitting that the shoe company honors him with a specific trail shoe model that speaks about the man. 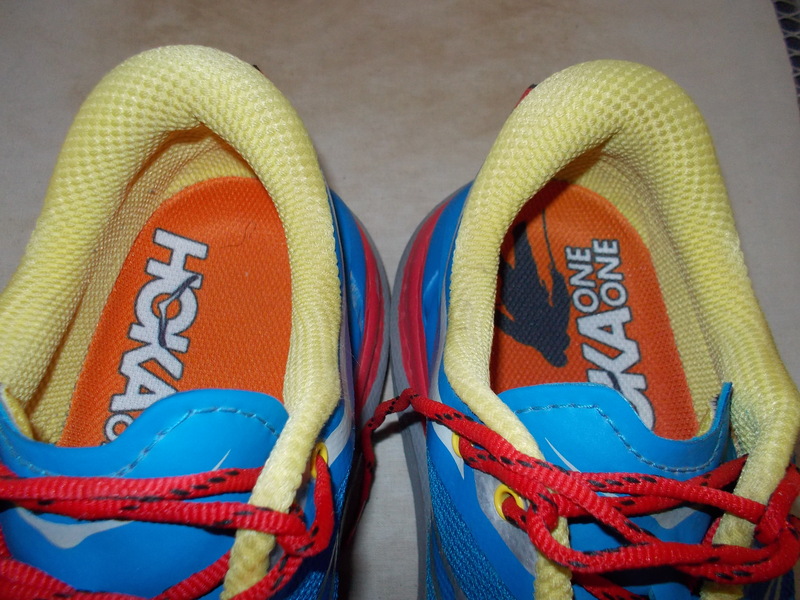 Thus, HOKA One One users around the world are excited to have a hand on the said shoes. As a one of his clients to his Coaching Services and having met him personally in last year’s edition of the Speedgoat 50K Trail Run (which I didn’t finish due to strict cut-off time at Mile 20), I sent him a request if I could buy directly to the shoe company of the earlier production of the shoes on the later part of May this year as I could see and read shoe reviews on the Internet about the shoes. I think my request was relayed by him to the company but I did not hear any response from them. So, I waited for the announced release to the distributors and sports stores on the first week of July but only to get the news that the release date will be sometime in August. On the last week of July, I monitored almost everyday the availability of the shoes by visiting the Website of the HOKA ONE ONE (HOO). The availability of the shoes at Running Warehouse for my particular shoe size was scheduled on the 3rd week of August and then to September and lately to October this year. My patience bear fruit on the last few days of July when I got a “green light” with the advise that my shoe size and model is “On Stock” on the On Line Sales of Hoka One One. I immediately ordered one pair and the shoes was delivered after two days. I paid $140 + $12 (Sales Tax), with a total amount of $152.00 with Free Shipping Fee. Finally, I was able to realize what I posted in our Facebook’s HOO Philippine Club Group Page three months ago, “I will be the first one to have this kind of shoes in this Club”. Color Combination——The first thing that will attract ones attention is the combination of colors of the shoes. Yes, they are the colors of Red Bull (silver, red, and blue), one of the Sponsors of Karl’s Runs and Races and the usual colors of the Shoe Brand HOKA ONE ONE—-blue & yellow. The other Speedgoat model has the colors, red, black and blue! If you are not attracted with the name of the shoe model, then for sure, you will be attracted with the striking color-combination of the shoes. Most of the runners that I know have the impulse to buy any kind of running shoes due to the striking color combination. Shoe Laces Holes——Obviously, these are the holes where one has to insert the shoe laces. As compared to the other HOO Shoes, this is the only model that has 5 holes, all the rest have 6 holes in one shoe. If you are not using the last uppermost hole of the Speedgoat (where it is used to lock the shoes with the foot), the shoes has only 4 holes! It means that it is easier and faster to tighten and tie the shoes and also to untie and remove the shoes from the foot. If you have the habit of changing your wet socks with dry ones in the Aid Stations in an ultra running event, the time on untying and tying your shoes would mean a lot if you are trying to catch up with those tight intermediate cut-off times in the different Checkpoints along the race route. Since I am always on the back of the pack in every race, this is a big advantage and useful for me! From Flat to Round & Light Shoe Laces——Earlier model of this shoes have those flat shoe laces, the same shoe laces on my HOO Challenger ATR and I was surprised to see that my shoes have those rounded shoe laces which are smaller/thinner in size as compared to those rounded shoe laces of my old HOO Stinson EVO. I have observed that the rounded shoe laces have an average length as compared to the longer flat shoe laces of the Challenger ATR. Those flat shoe laces have the tendency to get longer and longer as the shoe is being used for more mileages. It appears that Speedgoat’s shoe laces will remain with their present length and size. Observation about 1/2 size Bigger——In almost all those blogs and reviews that I’ve read from their sponsored elite athletes, they stated that the shoes is 1/2 size bigger. However, when I used them with my slightly thicker Drymax Trail Socks, I am surprised that they fit exactly with my feet with a little allowance (1/2 inch) from the tip of my big toes. This is exactly the same fit that I’ve experienced with my HOO Stinson Evo which I consider as my best road racing and training shoes so far. With the use of the regular Drymax socks, I have observed that there is more room for my forefoot and toes to splay on the toe box area of the shoes. It felt like I was using my Altra shoes! If it is too roomy for my feet if I use the ultra thin & light Drymax socks, I might try to use the additional insole of my HOO Challenger ATR (The Challenger ATR has two inserts/insole in each shoe). With my experience in using the HOO, I simply tighten the shoe laces more to prevent my feet and toes to be moving unnecessarily while I am running or hiking. After running with them for almost 100 kilometers (62 miles), I could feel that the shoes had stretched a little for more space for my toes and forefoot. Thickness of Sole——All the shoe models of HOO have thick soles that is why they are fondly called as maximalist running shoes. 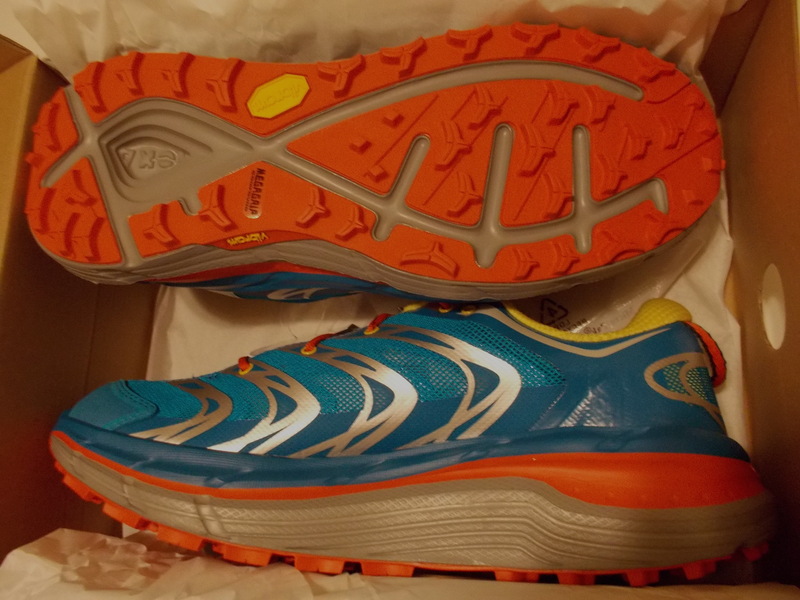 However, this model is an exact copy of their Rapa-Nui 2 model which is also designed as a trail shoes. The Rapa-Nui has a stack height of 33 mm on the Heel portion and 28 mm on the Forefoot section. The 5mm difference, popularly known as “heel-to-toe drop”, gives a feeling of “rockered forefoot” which according to the HOO designers and engineers provide a more efficient gait, better running form and faster “heel-to-toe” transition of the foot during running. Whatever that statement means, I assume that it will make a runner faster by some milliseconds! The Speedgoat’s sole thickness has a stacked height of 34 mm on the heel and 29 mm, maintaining a difference of 5 mm, that looks to be deceivingly thicker than the Rapa-Nui 2 model. The bottom-line is that this shoe, just like the other HOO models, the thick soles will give you the best comfort to your feet on your runs on the road, as well as, along the trails whether they are technical or not. And to be more specific, I find more efficiency in running with all the HOO models when I land my foot deliberately with the heel first and letting it roll towards the forefoot. With the Speedgoat, I feel more cushion and comfort most specially in the downhill running as the “rocker” effect in ones gait is more pronounced and experienced. In ultra running distances, such comfort will give an edge to the runner for more sustained strength on the legs during the day and night running. 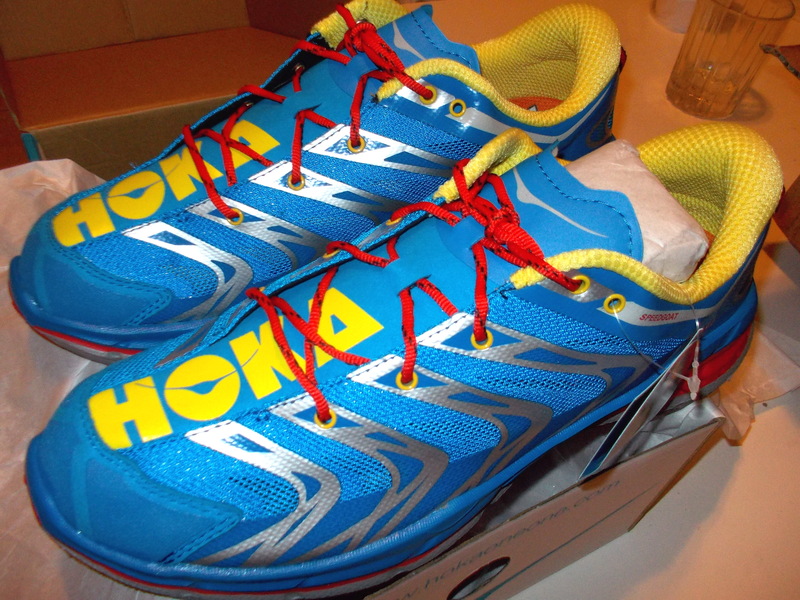 And did I tell you that you have faster recovery after an ultra race if you used a Hoka One One Shoes? Well, it’s true! Metagrip VIBRAM Outsole——From the HOO Bondi B, Bondi Speed, Stinson EVO, Huaka, and Challenger ATR (the shoe models that I’ve used for the past 5 years of running), the common denominator as a weakness of these models is the durability of their outsoles. After running for the first 100 kilometers of each of these models, you can already see a significant “wear and tear” on their outsoles which I never experienced from the other trail shoes in my arsenal. But the Speedgoat is some sort of a Redemption Shoe for all HOO “addicts” and loyal customers as they are fitted with the Metagrip VIBRAM Outsole. After running on single track trails, rocky trails, and fire roads for almost 100 kilometers, I could not see any signs of “wear and tear” from the Vibram outsole which is a big improvement from my old and ‘soon-to-be” retired other HOO models in my arsenal. This is the MOST significant feature and advantage of this model from the other trail shoes of HOO——the durability of the outsoles of the shoes! Cushioned Tongue——Not only for being cushioned but they are also a little longer but does not affect ones efficiency in running and would not cause any abrasion on the front part of the ankle. One would notice that there are TWO slots on the tongue where the shoe laces coming from holes #2 and #3 would pass. I have observed that these slots would maintain the position of the tongue while on the run giving more comfort on the top part of the foot. Most of my trail shoes have only one slot on their tongues and after every run, I would observe that the tongue have the tendency to slide towards the outer side of the foot/shoes and this movement allows the tendency for the debris from the trail to get inside the shoes. I was even more surprised when I did not experience any small particles from the trail getting inside these shoes. I guess, it is time for me not to use gaiters for this shoes! Cushioned Upper Part of Heel Counter——This is the yellow-colored portion at the heel counter of the shoes. I’ve noticed a big difference of this part of the shoes when compared to my HOO Challenger ATR as the Speedgoat has a more pronounced cushion that would be flashed closer and tight to the Achilles tendon and both sides of the ankles. I’ve observed that my Achilles tendon sits comfortably on the shoes even if I have the shoe laces tighten to the max. Light and Porous Material On Its Uppers——Have I told you that this is one of the lightest shoes of HOO? Actually, it is the third lightest HOO model in my arsenal being the Challenger as the lightest and the Huaka as the 2nd lightest. The shoes has a weight of 9.7 ounces despite the fact that it has a Vibram outsole and more cushioned tongue. The light and porous material on its Uppers contributed to the lighter weight of the shoes. It also gives more breathability to the feet where air would enter in these porous holes during the run most especially in hot and humid conditions. However, in water/stream crossings, water would easily get inside making the the socks and lining of the shoes wet and damp but with the continuous pounding of the feet, these water would easily exit through these porous holes! Through my past experiences in running in the lahar areas and rivers in the Mt Pinatubo 50K Trail Run and Clark-Miyamit 50-Mile and Marathon Trail Races, these shoes would not prevent those abrasive lahar from entering the shoes. Did I say dust entering the shoes? Yes, the dust would enter through these porous holes and it is advisable not to use white socks in them. Surprisingly, there is also a Drymax “Speedgoat” Trail Socks available in the market that would match the goods looks and functional capability of the shoes and they come in black/gray color! Thickness of the Lugs and Lug Pattern——Yes, the lugs on the outsole are thicker than any of the HOO trail shoes that I have and they are 5 mm thick! This is almost the same thickness of the outsole lugs of my Salomon Sense 3 (Soft Ground) and Inov-8 Roclites (but, they are NOT Vibram outsoles!). However, most significant improvement and advantage of the HOO Speedgoat from these other shoes is the pattern on how they are positioned on the outsole. The pattern of lugs on the sole would show a figure of number 8, as seen from the top view. The figure 8 is the space in-between the array of lugs and it looks like a loop course where the heel portion has a cave or depression on it. According to the designers and engineers at HOO, such pattern would result to a feeling of running with a “fully independent suspension system” (like a 4 X 4 truck) on the different parts of the outsole when running in a technical terrain or trail. It means that if you stepped on a root or rock, the specific part of outsole that contacts with the object will be the only one that compresses while the rest of the outsole remains without any deformation. I suspect that the “cave” or significant depression on the heel would allow better ride and cushioned feeling for those “supinator and pronator” runners. 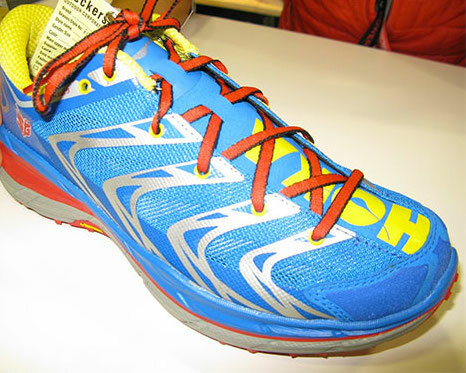 Having been a HOO user for the past five years, I would say that this particular model will be my racing and training shoes for my ultra trail running events in the future. Everything is almost perfect with regards to its Comfort, Speed, Security of Fit, Durability, Agility and Responsiveness and Protection to the Feet. I could not see any major flaw or anything to be corrected or improved on the shoes without compromising its light weight and perfect fit on my feet. After mentioning those significant changes and improvements on the shoes plus the fact that I have logged almost 100 kilometers (62 miles) with these shoes (to include 10+ miles on the paved road), the question is, “Will I highly recommend these shoes to everybody for them to buy as their trail running shoes?” Yes, of course! I am now in the process of ordering my 2nd pair of the Speedgoat (Red & Black Model) through the Running Warehouse website! 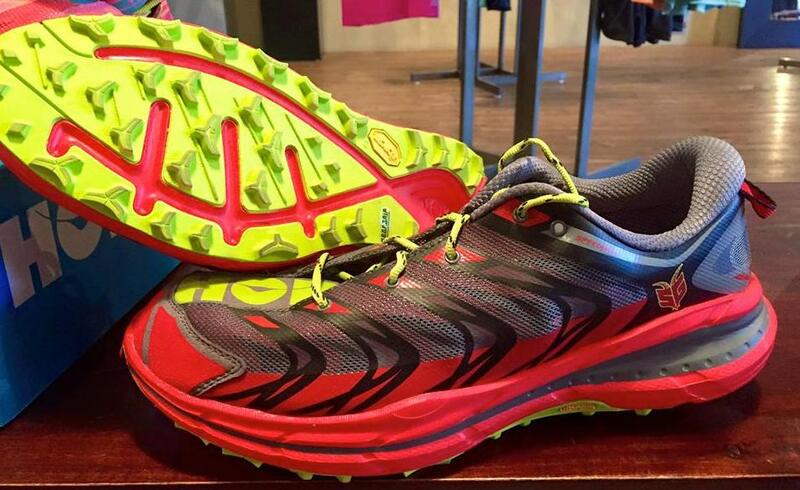 So far, this is the best HOO trail shoes model in the market right now.